CONGRATULATIONS on being selected as an Agile2019 Speaker! The Accepted Speaker Logisitics webpages will serve as your “home base” for Agile2019 Conference information. Please familiarize yourself with the information below. Information will be added and updated on this page throughout the planning process. 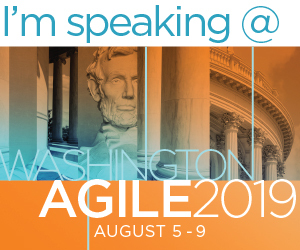 Should you have any questions about your speaking engagement at Agile2019, please contact, Tarah McMaster at tarah@agilealliance.org. Looking forward to seeing you at Agile2019 in Washington! Please refer to this email for details on the Deadlines below. Let the World Know You’re an Agile2019 Speaker! You’re speaking at the largest, most prestigious Agile conference in the world! Use the Marketing & Promotion tools below to promote your Speaker status and Session(s) to your clients, prospects and colleagues to build awareness for yourself and your business in the months running up to the conference. Please be sure to review when and where your session is scheduled to take place as it may have changed since acceptances were sent out. Alternatively, you can also view your session timeslot & location by logging into the Submission System. Attendees will know you by your Event Schedule Profile [SCHED]. Please check to make sure your Profile within SCHED is accurate, complete, and up to date. All speakers were sent an email with log in instructions the week of April 15th. If you already had a SCHED account from the previous year – you can login using your existing email and password. If you did not have an account, an Agile Events account has been created for you and login instructions are included in that email. Information including First Name, Last Name and email from your Agile Alliance account submission system profile has been imported to your Event Schedule Profile [SCHED], however be sure to also ADD a photo and web address as well as update your bio information. Let everyone know you are speaking at Agile2019. Post your Speaker’s Badge on your websites, social media sites, blogs, emails etc. Breakpoint Books will be managing the collection of speaker books to sell at the Agile2019 Bookstore. Download the Agile2019 Bookstore Form and submit before the DEADLINE - July 13th. Registration & Hotel instructions are based on honorarium packages selected during the acceptance process. Please refer to the Speaker Logistics email sent the week of April 16th for individual instructions. Registration instructions for speakers was included in the Speaker Logistics Email sent on April 26th. ALL speakers must register using the unique registration link included in the email. By Telephone –+1 800.228.9290 and mention "Agile2019"
We expect the hotel to sell out. Please book before April 26th! Room quantities and date availability is based on first come, first served basis. If the hotel sells out, you may subject to a higher room rate and the Agile Alliance will only apply your honorarium at the Gaylord National and only at the conference rate of $259. Please book your entire stay and we will arrange to deduct the complimentary nights from your bill upon checkout. For example if you are planning to stay for 6 nights, we will deduct for 4 nights upon checkout. Agile Alliance will only apply your honorarium at the Gaylord National only for the negotiated conference rate of $259. Should you wish to upgrade or extend your stay, you are responsible for any difference in room rate and/or nights in addition to your honorarium. The following outlines information regarding the session Setup & Supplies for the Agile2019 Conference. All rooms will be set in Rounds of (10) people to the following maximum capacities. Each room will have a standard set of equipment & supplies [listed below]. Microphones & Audio - (2) Wireless lapel/handheld microphones & Audio capabilities will be provided. Note: If room is small, audio capabilities will be provided however, microphone may not be necessary. Wireless Internet - Access will be provided throughout the meeting space & public areas of the conference! Laptops - Speakers are required to provide your own laptop. If you do not have a laptop computer then please make arrangements to borrow a laptop. Supplies - (1) flipchart, paper pad and (2) markers. Note: You are able to tape flip chart paper on the walls using blue painters tape [low tack]. Session Handouts are available for printing onsite at the Speaker Business Center. The limit for printouts is maximum (10) black & white pages front and back. The Speaker Business Center will be located in the Potomac Foyer, 2nd Floor [Lobby Level] of the Gaylord National and will be open from 7:30 – 17:30 Daily. Speakers are responsible for the arrangement of and any shipping and receiving charges. All packages delivered to the hotel are managed through The Fedex Team which acts as the business center and package services department for the property. We have created an Agile2019 branded PPT template for you to use for your presentation [optional]. All projectors use 16:9 aspect ratio [4:3 is also available]. Please check back in a few weeks for the template to be available! One of the biggest requests from attendees is access to speaker presentations before and after the conference. We are expecting speakers to upload their presentations to the Submission System. We recognize that some of you will be tweaking your presentation until the last moment. We request that you upload what you have by Friday, August 2 and then re-upload your final presentation by Monday, August 12. Step 2 - Open the Session Detail Page: click on the hyperlinked Title of the session to open the session detail page in your browser. Step 3 – Choose Your File: Go to the Attach a PDF: section at the bottom of the submission page right above Public Comments and Click “Choose File”. Find the file you wish to upload and select it [Note: It must be a PDF file & no larger than 20MB]. Side Note: In the Attach a PDF section, you will see all materials previously uploaded during the submission process [if applicable]. These have been pre-set to visible to attendees. Step 4 - Select visibility: Click on the icon to the left of the file name to change it between visible to conference attendees (icon is black) or not visible (icon is gray). The default for new file uploads is to be visible to attendees. Multiple attachments? Please repeat steps 3-5 for each additional file you wish to upload. Step 5 - Save Changes: click on Update Attachments to save. Now, repeat from Step 1 for each of your accepted sessions. Note: Presentations will not immediately display on the online Schedule. Please allow 24 hours.